These cute little earrings are the perfect accessory to any outfit. The earrings are a striking red which will add a pop of color to your clothes and spice up your look. 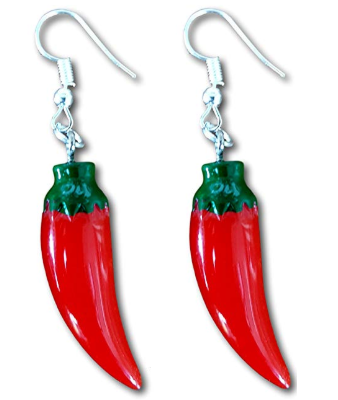 The red chili pepper earrings are handmade. Don’t worry, while they are made from polymer clay they aren’t too heavy on the ears. They are also re-sizable, allowing you to change the size to fit your needs. These earrings are perfect for any occasion, and for all seasons. They give your outfit a bold addition, without you looking too funky or out there; perfect for experimenting with your look!